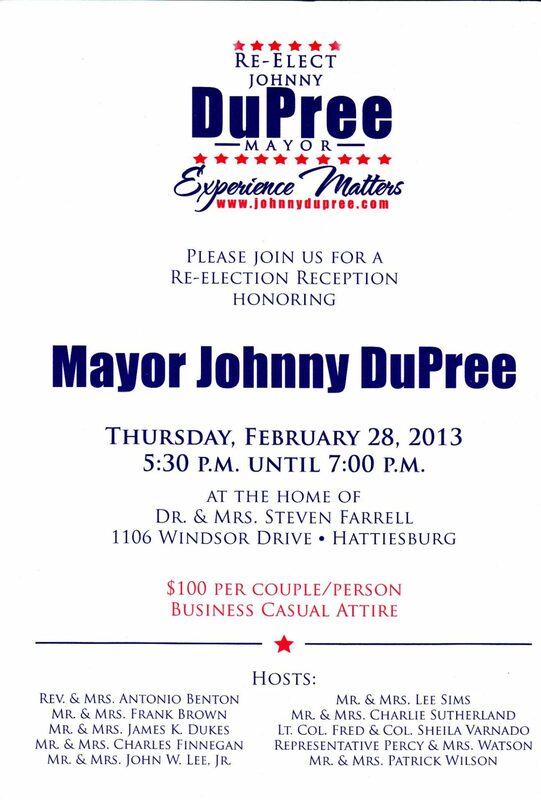 Dupree to have Fundraiser Hosted by Supporters. FBI Still Investigating Mayor Dupree and Municipal Court. Mr. & Mrs. Patrick Wilson. Notably absent are Forrest County NAACP President Clarence McGee, Reverend Charles Bartley, and Glenda Funchiss. These individuals got on the steps of city hall and in city council chambers and called our government "plantation style" and racist "like the days of Gone with the Wind" . Dupree sat back silently in an apparent endorsement of the remarks. This incident arose when Eleanor Burns and Frank Harris didn't get reappointed to the school board. Mayor Candidate and City Councilman Dave Ware left town and avoided the vote. That must make him a yellow bellied racist. Also absent from the host list are Russel Davis and Tim Pittman, who were involved in an overtime scheme to defraud taxpayers. Mayor Dupree protected the appointees by classifying it as a personnel matter. The Invitation says "Experience Matters" well it sure does and so does one's record. One's record matters more than anything else, because that is all we have to go on. Looking back on Dupree's record we see severe shortcomings. (1) Our city has stunk to high heaven since Dupree brought in USA Yeast under a terrible contract. (2) Four top Dupree Appointed officials resigned under theft and fraud allegations in the past 12 months, Dupree called it a "personnel matter" which shields the public from disclosure of the investigations findings or lack thereof, and no one has been prosecuted. (3) Eaton School, a national African American Landmark has been destroyed as a result of contractor negligence, and Mayor Johnny Dupree has petitioned the state to have the building demolished and sweep the scandal under the rug. (4) Dupree flat lied to the people of Hattiesburg and to City Council members on the city's internal affairs investigation into fraud and corruption in the court. City Council sent Dupree a UNANIMOUS no confidence letter essentially calling him the liar he is. So, people, read this list. It tells you who is influencing our city's politics. At least there is a good criminal defense lawyer on there, as the FBI is still investigation the city in the Municipal Court corruption scandal and indictment are likely to come down soon. It will be interesting to see if Mayor Dupree or City Attorney Charles Lawrence will be indicted? If so, there will likely be a Duke in the corner. The Hattiesburg Patriot has arranged for 200 citizens to attend the reception free of charge. Simply mention the Hattiesburg Patriot and enjoy the free food and drinks. Jay, just drop by and tell them the Patriot sent you. It’s free to the first 200 patriots. oh, where do I get a ticket??!!?!!!? There are a few grammatical errors in lower portion of the column. Other than that, great read! They need to keep that investigating going, who knows what else they might find. HP…you may need to up that life insurance policy lol. Evelyn Payne, what part of it do you find surprising or don’t understand?